Description Robot and cat are on their run to escape from the burning lava, that might brake their friendship! Toss the cat, to collect crystals and speed up the robot so lava can't hurt you! Watch out on obstacles, they might slow you down, and even kill your cat! Earn various achievements as you go for the highest score! 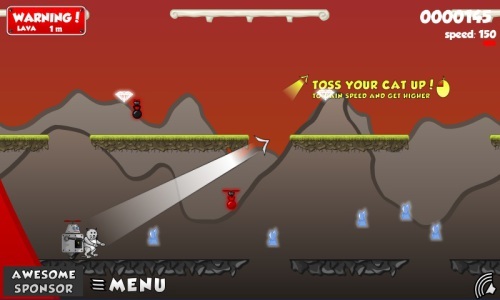 Controls Aim with the mouse, and click to toss your cat!